The SoWa Artist Guild at 450 Harrison Avenue, Boston, is home to over 80 artist studios. It is an association of professional studio artists whose aim is to promote the diversity and individuality of the artists working in this creative space. In 2005, when artist Stephen first rented a studio at 450 Harrison Avenue, the area was generally run down and underdeveloped. At the time, there were a few galleries in the upper floors of the building and they typically had their openings on the first Friday of the month. Artists, who had studios in the building, decided it would be a good idea to also open their doors when the galleries had their openings. It was a great concept, however, in the beginning, it was disorganized. Stephen decided to get all the artist’s together to help promote their creative work. His aim was to attract more members of the public to the area and to make First Fridays a studio artist’s event. He also wanted to build a community of artists who supported each other. This resulted in Stephen Silver starting the SoWa Artist Guild. The Guild initially started with 20 artists. Each artist member paid annual dues to the Guild to fund expenses. A graphic design firm in the building was retained to create a Guild logo and website for very little cost. With this help, they were able to start promoting the SoWa Artist Guild and First Friday’s. In order to become a member of the Sowa Artists Guild, you had to have a studio in the building. However, it was not mandatory for artists to join. As the years went by the Guild grew in numbers and it now has 84 members. Through the Guild's PR, advertising and website, First Friday's continued to gain in popularity. Since 2008, they have been showcased several times on Chronicle a popular local Boston TV show and have also been featured in Boston’s local newspapers such as the Boston Globe. Stephen Silver, a New York native always had natural artistic talent. At the age of 4, he learned to draw by watching Jon Gnagy’s black & white TV show. By the age of 9, he could oil paint realistic landscapes copied from pictures. After he graduated from university Stephen went on to have a very successful career in the business world as CEO of multiple companies. He moved to Boston in 1972 where he eventually co-founded a successful start-up that he sold in 1994. In 2001, after spending years turning around another company, Stephen was starting to burn out and was losing his drive and passion for business. Then after 9/11, he felt the world was going to change, and he found someone else to run the business and resigned. At a loss for what to do next, his wife suggested he paint as it was something he always loved. He decided to take some classes at the School of the Museum of Fine Arts in Boston. He also started taking lessons from a master artist at the Fenway Studios in Boston who was a very technical teacher. After a couple of years, he essentially got a fine art education without going to school for it. He learned all about realistic painting techniques, best practices and how to layout color and mix paint. Then he discovered his neighbor, Beverly Woods was also an artist. They became friends and started critiquing each other's work. Beverly suggested they get a studio together, which they did at 450 Harrison Avenue in 2004. Then, after painting representational landscapes for a number of years, Stephen decided he wanted to be more creative, and have more of a challenge. One summer while away, he started painting with a palette knife and discovered a new world. He now uses no reference material and when he starts a painting he is not sure what direction it will take. Drawing inspiration from a lifetime of observing, he develops abstract compositions that are mostly landscapes. He paints over a lot to adjust color and shapes as the composition develops. All of his paintings use a lot of colors. While hard to classify, Stephen could now be called a Colorist and Expressionist. “The challenge for an artist, however, after painting for so long, is you want to change it up a bit and try something new. You don’t want to do the same thing over and over again." This resulted in Stephen doing several series of different themes. Some are geometric, some incorporate abstract figures and some are based on the doodling he did when he was in business. Stephen’s work can be seen in various galleries around the country, and has been in numerous shows and is in many private collections around the world. Debby Krim is a founding member and co-runs The SoWa Artist Guild with Stephen Silver. She also designs all their marketing collateral. Multi-talented Debby certainly does not fit in one creative box. She is a Photographer, Jewelry Maker, Graphic Designer, and Painter. She is successful at all she turns her hand too. The minute you meet Debby the first thing you pick up on is the amazing energy she gives off. Debby is energetic, positive and so much fun to be around. You can see how she manages to juggle all the creative outlets she has and still looks amazing for her 60 years. Debby likes to start a project and work until its finished. She feels it’s optimal to work that way. Originally from Cranston Rhode Island, she spent her summers taking art classes at Rhode Island School of Design (RISD). Her parents always encouraged her art and from a young age, she loved creating and working with her hands. When Debby went to college she didn’t apply to RISD. She told everyone that she wanted to move away from home. She did this as she had a fear of being rejected. At the time the BU School of Fine Arts felt that if you sold your art you were selling out and it was wrong. At the School, they taught you that graphic design wasn’t art which probably explained why there graphics department was floundering. You were almost embarrassed to take that class. All that changed for Debby when she attended a Milton Glaser talk and slide show. She saw how creative graphic design is and she learned as much as she could about it. She wanted to get a job after college so switched over to education and did many jobs in her 20’s to support herself; bartender, sandwich board girl in Harvard Square, you name it she worked at it. Debby loves creating and can appreciate all types of art. With her positive nature, Debby is solution driven. It wasn’t until her daughter was older that Debby got back into art, she was in her early 40’s. She started taking photos and people were really reacting favorably to them. She decided to set up a show and it went really well. She visited 450 Harrison Ave. and asked an artist if she could rent a space from her to show her work. The artist said no, but advised her to check out renting a studio from GTI Properties. After seeing a sign in the hallway she called GTI Properties, signed a contract that Monday and moved in. Her space has grown over the years. Her work has been featured in Hollywood films, T.V. shows, museums and numerous galleries throughout the United States. She loves abstract photography, using form, color, light, and pattern to make an interesting photo. She was in the antique toy business with her husband and was always drawn to toys and she was trained in oil painting. Using this interest she paints oil paintings of toys. Debby took a Jewelry and Metalwork class in RISD. She makes beautiful one-of-a-kind handmade jewelry. She loves playing with and manipulating the metal into beautiful unique designs. The necklace Debby is wearing today draws influence from Andy Warhol Soup Can paintings. She also knows she needs to do things her way and always goes with her instincts. “You're given a list of rules but you don’t need to follow all the rules". Debby doesn’t relax, she is a doer and creator and uses her energy to put into her creative work. You won’t find her sitting and reading. She needs to work with her hands and all the mediums she uses all have the same thing in common, light, design and shadow can be applied to all creative mediums. She desires to see things in a positive light. Art can sometimes show the worst of everything, and Debby’s view of the world is positive. She likes her art to leave a positive impression on her viewers. You can currently see Debby’s work at an exhibition at Lanoue Gallery, 450 Harrison Ave #31 Boston, MA 02118. Exhibition runs until May 27th. Pointillism is a technique of painting in which small, distinct dots of color are applied in patterns to form an image. Boston born Tom Stocker is a Pointillist Artist who paints oriental rugs. He attended the School of the Museum of Fine Arts with a scholarship and received a BA in Russian at U-Mass Boston. Later, as an antique dealer in Boston, he became interested in oriental rugs and saw a connection with them and painting as related art forms. 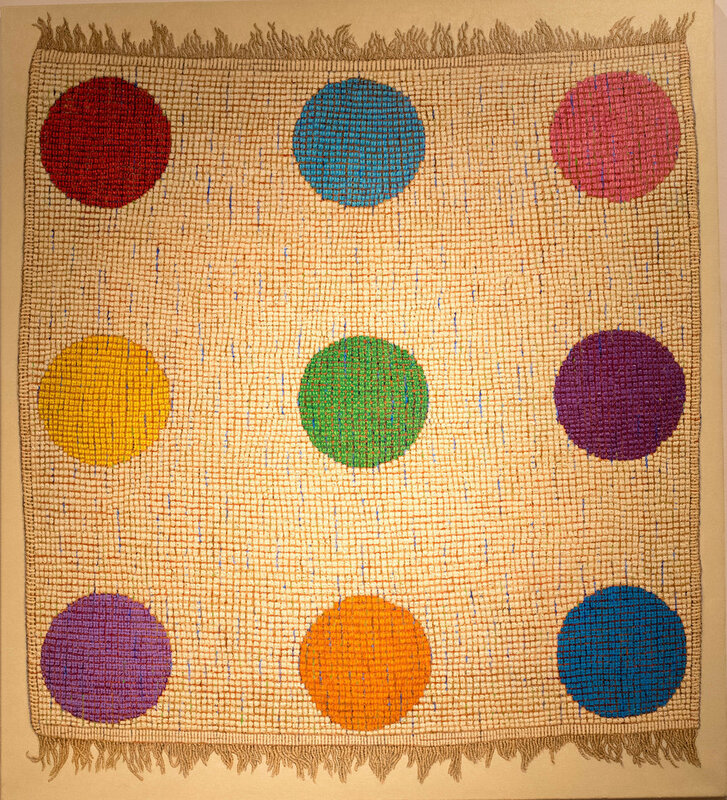 In 1990 he joined the New England Rug Society, where he was able to learn first hand from collectors and scholars. Tom’s first solo show was at the Museum of Armenian Art in 1994 where all of the 15 paintings were of Armenian carpets. In 1996, he sold a rug painting to Fidelity Investments whose curator commissioned Tom for a painting of a nine foot high antique Anatolian rug, which had been displayed for twenty years in the lobby of their corporate headquarters. Tom was admitted that year to Boston’s prestigious Copley Society of Art where he was given two successful solo shoes in 2002 and 2007. Representation in New York soon followed in the esteemed OK Harris Gallery with a solo show in 2008. In 2010, Tom became a member of the Cambridge Art Association and was awarded the CAA’s Artist of the Year in 2014. When the Great Recession hit in 2008, the Art World stood still. Artists looked for mutual support, and Tom found a welcoming community of artists with the SOWA Artist Guild at 450 Harrison Avenue in Boston, where he has leased a studio since 2009. Once there, good fortune struck with the sale of several paintings to an American collector working overseas. As an artist, he always wanted to do something unique. “You were told in art school to develop your own style”, he says, “but you have to learn the basics first. I value the rigorous training I had at the Museum School back then”. Tom has adapted his unique style to contemporary subjects and abstract works. He learns from artists throughout history, from ancient Greek sculpture to pop artists such as Johns, Lichtenstein, and Warhol. Inspired by Byzantine mosaics and Warhol, he created a large mosaic of Marilyn using 6,000 m&m’s in 21 colors. A psychiatrist bought it for his climate - controlled music room. Tom is pleased that people are surprised by his work and appreciate their questions. “How long did this take”, is the most frequently asked. “A lifetime.” is the short answer. Most recently, he has completed a commission of the Three Graces, an ancient Greek sculpture which he has reimagined as a painting in three flavorful colors: vanilla, chocolate, and strawberry - “The Neapolitans”. If you join the guild everyone makes a point to welcome you and you belong to the building and then you become part of the SoWa story. Many artists feel alone and misunderstood that’s why it is so important to surround yourself with like-minded creative people, who offer you their experience and unique vision, and the right environment for you and your artwork to flourish and grow in ways you never thought possible. Being part of a community offers you a chance to have other artists critique your work in a constructive way so you continue to create work that excels and is continuously evolving. You are supported and inspired by other artists and also accountable to keep up with your work and create. The vibe at the SoWa Artist Guild is one of fun, creativity, welcoming, and really inspiring. Walking through the studios would make even a non-artist run home and pick up a paintbrush. As the area has developed, more and more artists, galleries, and businesses have moved into the area. With 35 galleries, design and craft boutique stores, restaurants, accessories, and businesses the area was re-branded to be called The SoWa Art + Design District. It is now a thriving vibrant creative neighborhood full of life. Over the years the Guild has promoted the artists at 450 Harrison Avenue to get the public to know they are there. GTI Properties owns and manages all the properties in the area and also runs popular open markets on the weekends. SoWa spans the area from Mass Ave to Herald Street and from Shawmut Ave to Albany Street. Ample parking is available and public transportation includes the Broadway, Tufts, and Back Bay stations, and the Silver Line. The SoWa Art + Design District is a must visit for anyone living in or visiting Boston. Be sure to come check out the artists in their studios on the next First Friday, June 1st, 5-9pm, or stop by during the week and visit some of the artists working in their studios. There is also a SoWa Open Market outside the building every Sunday, May - October, 10 am - 4 pm. Find out more: www.sowaartists.com and www.sowaboston.com.